My mom is obsessed with keeping a stocked freezer, but I guess I don’t really take after her, because my freezer tends to be relatively empty, aside from random containers of stock/ramen broth, frozen dumplings and pierogi. I admit, I store buy frozen chinese dumplings and pierogi for those times that I just don’t feel like cooking. I tell myself it’s because of ease and convenience, but really, I just love the taste of frozen pockets filled with deliciousness. Pierogi are fast, tasty, and ideal for when I let myself get too hungry and become a crazy unthinking monster. (This happens more often than you would believe). I’ve always been a frozen pierogi buyer, but now I think I’m going to have to go homemade forever. It’s Oktoberfest right now and that means two things: beer and sausages. I don’t partake in the beer much (Mike drinks up my share), but I do love sausages. 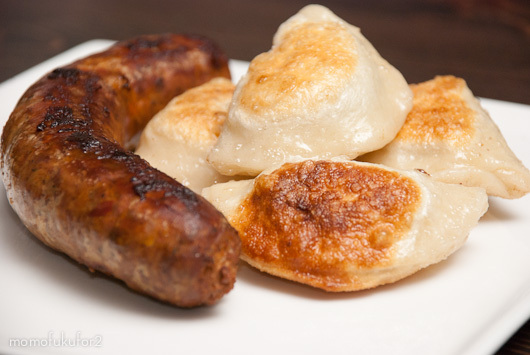 Sausages and pierogi are just one of those pairings that I find perfect, especially when the weather turns a bit chilly. I found an old Gourmet magazine pierogi recipe on epicurious.com and for my first pierogi making experience, it was great. The dough was a dream to work with and for an extra treat, I fried up pierogi in some butter to crisp up the skin. They kind of ended up looking like some sort of Asian dumpling-guess I just can’t get that out of me-but they were all pierogi potato deliciousness. I couldn’t resist putting my own twist on the pierogi though: instead of filling all the pierogi with a potato cheddar cheese filling, I mixed up potatoes with green onion oil. The result was insanely good. 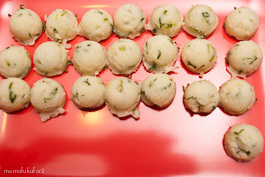 The green onion oil made the potato filling rich and umami filled. The green onion pierogi were so good that it was a little like playing the odds while we were eating-all the pierogi looked the same, but biting into one of the green onion ones was a little like winning the lottery. Put flour in a large shallow bowl and make a well in centre. 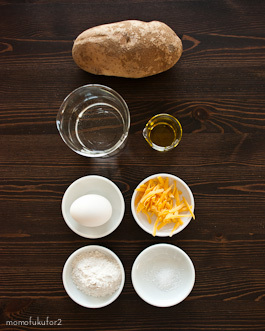 Add water, egg, oil, and salt to well and carefully beat together with a fork without incorporating flour. 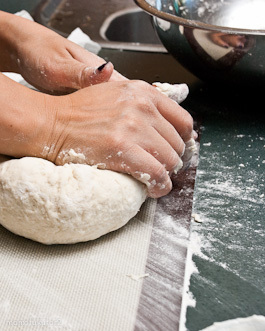 Continue stirring with a wooden spoon, gradually incorporating flour, until a soft dough forms. Transfer dough to a lightly floured surface and knead, dusting with flour as needed to keep dough from sticking, until smooth and elastic, about 8 minutes (dough will be very soft). Invert a bowl over dough and let stand at room temperature 1 hour. Peel potatoes and cut into 1-inch pieces. Cook potatoes in a large saucepan of boiling salted water until tender, about 8 minutes. 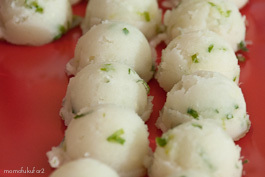 Drain potatoes, then equally divide in two bowls. In one bowl add the cheese, salt, and pepper, in the other bowl, add the green onion oil. 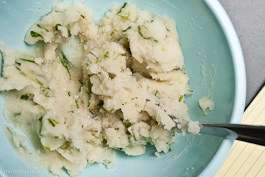 Mash the potatoes until smooth and mix thoroughly. 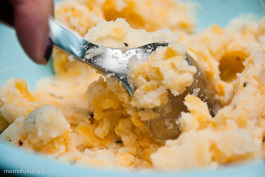 When mashed potatoes are cool enough to handle, use a small cookie scoop to scoop out the filling. Cover and keep the filling in the fridge until you are ready to fill your pierogi. 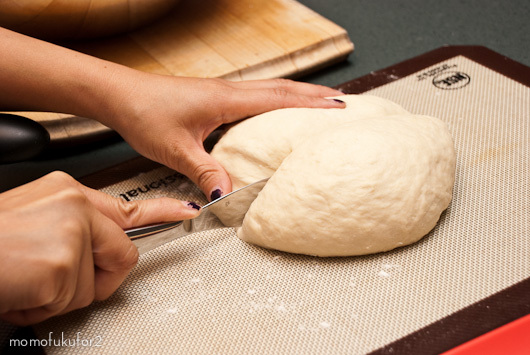 Halve dough and roll out 1 half (keep remaining half under inverted bowl) on lightly floured surface with a lightly floured rolling pin into a 15-inch round (1/8 inch thick), then cut out 24 rounds with lightly floured cutter. Holding 1 round in palm of your hand, put 1 potato ball in centre of round and close your hand to fold round in half, enclosing filling. Pinch edges together to seal completely. Bring a 6- to 8-quart pot of salted water to a boil. Add the pierogi, stirring once or twice to keep them from sticking together, and cook 5 minutes from time pierogi float to surface. Drain and pan fry in butter or oil over medium heat until crisp. Oh how I love these treats! I am of Polish and Ukranian descent and have eaten these all my life. I like mashing the potatoes, adding Cheeze Whiz and fried onions and bacon bits to the insides. Mmmm good! I actually did this with whole wheat flour because I’m a silly health nut (why you may ask I did it with regular potatoes then… well, you can’t get away from all super carbs). I’m surprised at how well it worked. You use 7/8 of a cup of whole wheat flour to the cup of all purpose. Otherwise I did everything the same. I’ll be trying these again when I have green onions to do the green onion oil. My grandmother remembers visiting the homes of school friends who were peasants. 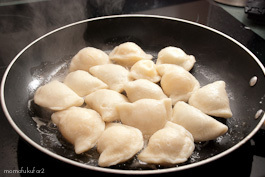 In their homes the pierogi were made with wholemeal flour, the dough rolled more thickly and the pierogi cut larger. The would be served at the table with one large bowl of sour cream in which everyone dipped their pierogi direct. Like other commentators, I have only known pieorgi made with bialy ser (white cheese) similar to Russian tvarog or farmers cheese. When filled with a mixture made of this cheese, potatoes and fried onions, they are known as ruski pierogi. Real pierogi – one makes pierogi only with white cheese – that is fresh cheese made of milk, something like a natural version of cottage cheese. And it’s mixed with potatoes and onions. Served either with butter and fried bacon or with sour cream. Whatever else is there is just a variation of the original recipe. I believe it is called FARMERS CHEESE. My Grandparents came from Poland with their parents (my great grandma&pa) and Great Grandma Iskra’s recipe calls for Farmers Cheese(yes…like solid cottage cheese), sauteed onion and mashed boiled potatoes…..boiled and then sauteed in butter…and serve with the browned butter and a folio sour cream….ohhhh yummmmmm! Yes, farmers’s cheese, or its also known as pot cheese. the dough my grandmother made was flour, egg, salt and sour cream. wish i knew the proportions, it was the best. also fry a slice of onion in the butter for a minute or so and then take it out and fry the pierogis. that’s a taste straight from heaven. I’m with you on this one. At a push, try using some Philly cream cheese – it will provide a passable substitute in this filling. Failing that, there are excellent instructions for making you own white cheese in a book called Polish Heritage Cooking which I commend to all English language users who love Polish food. Smacznego. Yayyy! I love you for this! 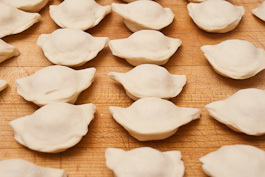 I bookmarked this and i’m looking forward to making these Pierogies. I’ve never made my own. So, this is going to be fun. Thanks for the recipe. My favorite are also blueberry. I am Polish and my Mom made many varieties but blueberry pierogi with browned butter and sour cream were the best. I make them every year for Christmas. Actually these aren’t pirogi. When you show them to someone from Russia, he will think, that you are trying to fool him. These things you made, they call “wareniki”. Real pirogi are more like a filled, fried bun (filled with meat&onions, potatoes&onions, or eggs&chives). My Ukrainian grandmother would make them with blueberries and/or cherries. They were amazing! Her dough was a little different though, as she used sour cream in it. Maybe not the healthiest but certainly memorable! OK, here we have a difference between Polish pierogi (which are like Russian vareniki) and Russian Pirozhki which are small baked or fried filled pastries. Often the dough for these is yeast based. The range of fillings may be similar: ground beef, cabbage, potatoes, cherries, sweetened farmers cheese, rice combined with fish, mushroom, dill and chopped hard-boiled eggs etc, etc, etc. Neither is incorrect, but they do refer to different things depending on which language you are speaking. Both terms are derived from the slavic root “pir” meaning “feast”. Anyone who has had the chance to try either version will understand the relevance of the name. Ppl shut up. I’m Polish and these are pierogi, BUT, here in Poland and Russia it’s more common to fill them up with meat, mushrooms and onions, or the sweet way, with forest berrie friut… You rarely see someone making pierogi with Potatoes, with chese yes, but not with POTATO. My polish grandmother never ever made the potato pierogi..it was always the cabbage and saurkraut…she would spend all day in the kitchen making them,,and it would take 10 minutes to eat them all….soooooo gooooood! 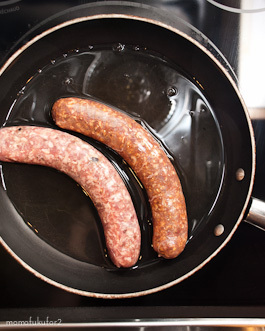 Balbina have u ever tried making a Kielbasa Meat and fill the Perogi dough w/ it this is also good ( The fresh Kielbasa not smoked and and homemade kielbasa…Yunny!! also i add mushrooms sometime chopped into the meat!!!! LOL Balbina, you’re a real balda… It’s not pierogi, it’s more like fried vareniki..
My potato mix I use is mashed with cream cheese, salt, pepper, butter sauteed onions and another cheese be it cheddar, farmers or american slices for flavor…… also do plum ones just plums out of the can and after you pan fry them sprinkle with powdered sugar….. awesome for a desert treat! Hey! I’m sorry if you’ve already answered this, but at what stage should you stop if you were planning on freezing them? Should the pierogies be boiled before freezing, or can that wait? Thanks! I can’t wait to try this recipe. I freeze mine BEFORE boiling. I also freeze them separately on a cookie sheet so they don’t stick together. If you cool them slightly and stack in a freezer container with a little melted butter, bacon fat or oil between them, they will freeze quite well after boiling as well, but I would only recommend this if you intend to serve them fried. Try adding fried bacon and onions. Also make a cream sauce by heating heavy whipping cream, butter and dill and pouring on top. It’s definitely not healthy. But it’s too delicious not to try once. My grandmother came to the US in 1899. She taught me to make pierogi. Her dough was different in that it contained no egg and a little baking powder. I think it may be due to not having eggs readily available as they were very poor. Her filling was potato and farmers’ cheese; also a cabbage/sauerkraut filling that I flavor with salt pork. 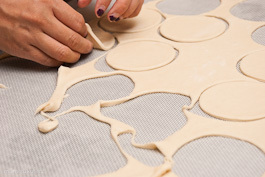 She would roll out the dough, put the filling near the edge and fold and stretch the dough over the filling, then cut the half moon shape with an upside down drinking glass. I still make them this way. My family doesn’t care for the farmers’ cheese so I have Americanized it with half cheddar and half Velveeta (of all things!). I plan to try this dough recipe but the last time I made an egg dough my family preferred my original dough. When you make blueberry ones, is the filling just fresh blueberries or do you doctor them up? My grandfather was from Lithuania – came here in 1910. He called these “Jim-ya-nosee” We drain cottage cheese in colander, salt and pepper, add fresh chopped onion and chopped up raw bacon. 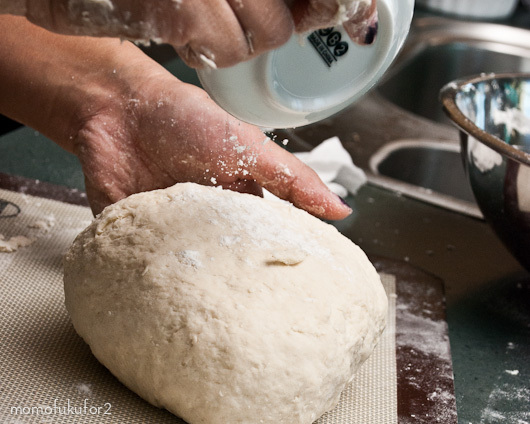 Make the dough out of flour, salt, egg and water. Fill, seal drop in hot water and when they come to the top, we soft boil for 14 minutes. Slice them open and put a big pat of butter and enjoy. We don’t fry them. We also make them with hamburger meat that has been seasoned. My grandmother was Polish and handed them down to all of us since he passed in 1945. Love, love, love them. My mom always makes her own cheese filling for the perogies. She takes several cartons of buttermilk and heats them on low until the buttermilk has separated, then lets it cool (up to 24 hours). Next, the cheese is removed from the whey. All the whey has to be squeezed out of the cheese or the product won’t work properly. She adds sour cream (enough that the cheese sticks together), salt and pepper to taste. She then rolls out the dough and fills the perogies with the cheese, cutting the edge with a saucer. they’re quite large! she puts the whey back on the stove to boil and cooks the perogies in the whey. Yum! Does anyone have a recipe to a fruit filling perogie? Im think like an apple one? I, too, am POLISH, and learned how to make these from my grandmother – who came to the U.S. when she was a baby (she learned from her mother…who learned from her mother…) and while I am not partial to and we rarely made potato, these are pierogie as I know them. Whhile blueberry are delicious, our family fav is saurekrat, we saute the kraut with salt pork, which is rendered and then put in a food processor to chop VERY finely, and we frequently add mushrooms as well, which also go into the food processor – we saute the kraut until it turns a lovely golden brown and then (after cooling) we get to stuffing! They also freeze beautifully, though we have to make tons in order for there to be any left to freeze!!! Oh my God! Thank you so much for this post! Pierogis were one of my favourite foods that I discovered in Canada. I haven’t been able to find them in Australia since I came back over a year ago but now I’ll be able to make them! Thank you! I’ll post the result on my blog once I’ve made them. I imagine I’ll find enough stuff left in my fridge and pantry at to make them. 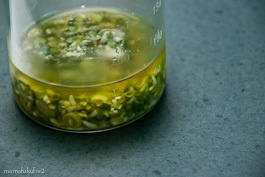 will the green onion oil last if I make extra? this looks so flavorful and filling. I can imagine how a great combination this and beer would make. yum2! Sorry, your recipe is wonderfull, but it is not a pierogi. In East Europe they hav name: vareniki (pl) /varenik. Other wise, i like it very much. aww man, I didn’t expect a polish dish here, so nicely surprised that our food is appreciated too! We were visiting in Palm Springs, CA and were at Costco and I purchases some of your potatoe and onion perogies. I cooked them this weekend as we were having company for Easter and they were a hit. As we are from Canada, do you happen to know if they will be coming to Lethbridge, Alberta at any time. I tried a few of the others as there were to guys demonstrating the pierogies. They are fabulous. Something like my Mother used to make. Keep up the good work. May I pin this to Pinterest? I have a Polish recipes board that I’d love to include this recipe there. I won’t pin until I get your permission though. Use heads of cabbage shredded in food processor for the above mentioned pierogi recipe 1 head of cabbage should be sufficient for 2 dozen pierogi. Boil shredded cabbage in salt water until tender but not too soft. Next, I buy Andrulis cheese (or farmers cheese) about 1 lb. and crumble. For 2 doz. half lb s/b good. Drain cabbage in collider. After somewhat drained, lay out a white bath towel and sprinkle the cabbage on towel. Roll up the towel and keep pushing down on the towel to drain cabbage thoroughly. Or use cheese cloth but the towel is quicker. Hi i am from Ukrain . and can say this is not pierogi! . this is Vareniky ,, i love my ones with caremilised onion and black pepper mash filling , then some more caramelised onions to toss them in just ufter frying them(frying is optional,I love them just tossed in onions and salt ) . Pierogi r baked like English Pasty’s . You have no sour cream in the dough. How can it be authentic? We’ve been having these since I was little. My nan used to make them (but they were way too thick) and my mum has modified the recipe to not make them too sickly. Ours are cheesy potatoes, then boil. Then we just brown some butter, pour a little over them, and accompany it with some double cream mixed with vinegar. Nom nom. I can only do a couple before I feel a little bleurgh, but my brother and dad can easily put away 10+ in a sitting. 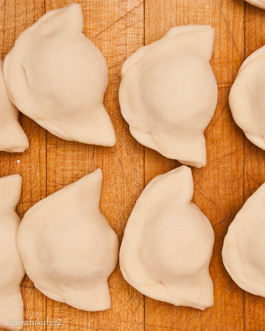 Try Anna Thomas’ recipe for some killer pierogi. OMG. You can ony make them once in a great while because they are so devastatingly good. Did you freeze them at all? Would you freeze after boiling, or after frying? When I was posted to Manitoba while I was serving in the military, one day they had pierogies on the menu and I did not even know what it was. I tried them and really liked them. They were so good. I have never made them myself but I am glad you are sharing a recipe.